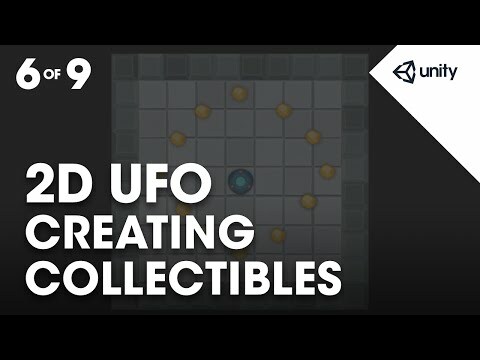 In this assignment we'll add collectable objects to our 2D UFO game in progress. We'll use Prefabs, 2D trigger colliders to do this, and add a one line C# script to make the collectable objects rotate. for our player to pick up. First open the Sprites folder. in the sprite renderer component. Set the sorting layer to Pickups. is still in the way. of the Pickups sorting layer. in front of the Name field. This is the game object's Active checkbox. the game object in the scene. which we can now see. the cursor is over the scene view. by dragging in the Radius field. must attract the attention of the player. So let's make the object more attractive. So let's rotate our pickup. One way to do this is with a script. Let's create a new script called Rotator. placing it in the Scripts folder. double click to open it for editing. to do it with this script. We want to rotate the object every frame. but we want to rotate the transform. with a search term Transform. Scroll down until you see Transform's public functions. There are two main ways to affect the transform. These are Translate and Rotate. So let's click on the link. This brings up the page for Transform.Rotate. Note again the two signatures. float values for X, Y or Z.
leave at default for this lesson. form that only uses the vector3 for direction. Let's return to our code. to rotate the collectable's transform. still exists in the 3D volume. ignore the axis we don't need. save this script and return to Unity. Let's test by entering play mode. And we can see our pickup object rotates. or to the prefab asset itself. game will be updated with those changes. it in to our Prefabs folder. to help organise our hierarchy. Let's create a new game object. is at origin, or (0, 0, 0). context menu to reset it. Next drag our Pickup game object on to it. selected, and not the parent. so we can see the entire game area. I'm going to place mine at the top of the playing area. Edit - Duplicate, or by using the hot key combination. second instance of the prefab. Let's hit play and test. pick them up and to count them. //Rotate thet transform of the game object this is attached to by 45 degrees, taking into account the time elapsed since last frame.